It’s a comfort food to the rescue day! I have an easy, cheesy, and low-carb Healthy Spaghetti Squash Casserole recipe for you. 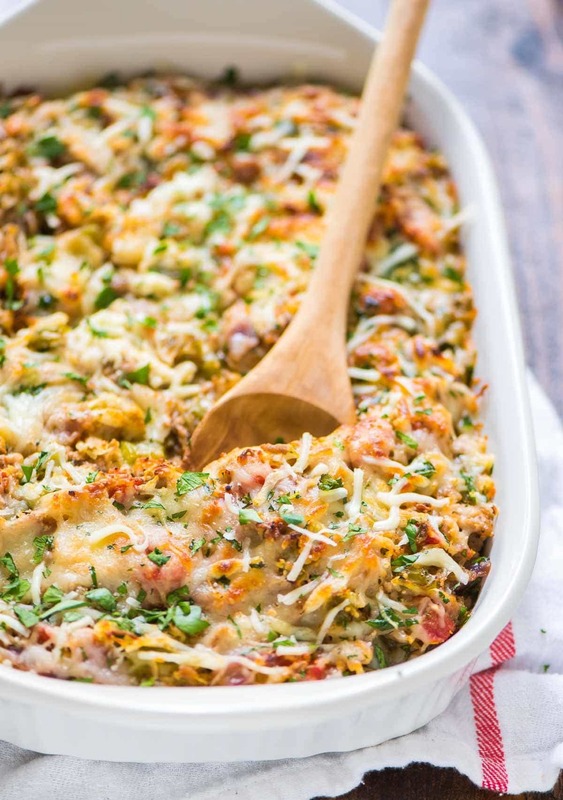 Whether you are looking for a meal to match your cozy night on the couch…or are already anticipating the week of easy, healthy dinners you are going to need after the weekend, this casserole has you covered! Growing up, spaghetti squash was an “on the side” affair…and even then, only if was topped with an appropriate level of butter and brown sugar. I still enjoy baked spaghetti squash this way every now and then for the sake of nostalgia—and because who am I pretending to be here? It’s delicious. I’ve also come to adore spaghetti squash as a component of more savory sides such as Roasted Spaghetti Squash with Parmesan Mushrooms and main dish recipes like Taco Spaghetti Squash Boats, Spaghetti Squash Boats with Chicken and Bacon, and today’s Italian-inspired Spaghetti Squash Casserole. The casserole filling is an easy mix of roasted and shredded spaghetti squash, diced tomatoes, bell peppers, Italian spices, and ground turkey (you can do the Spaghetti Squash Casserole with chicken instead if you prefer). All of the ingredients cook together in a single pan, and you can even get a head start by roasting the spaghetti squash up to three days in advance. 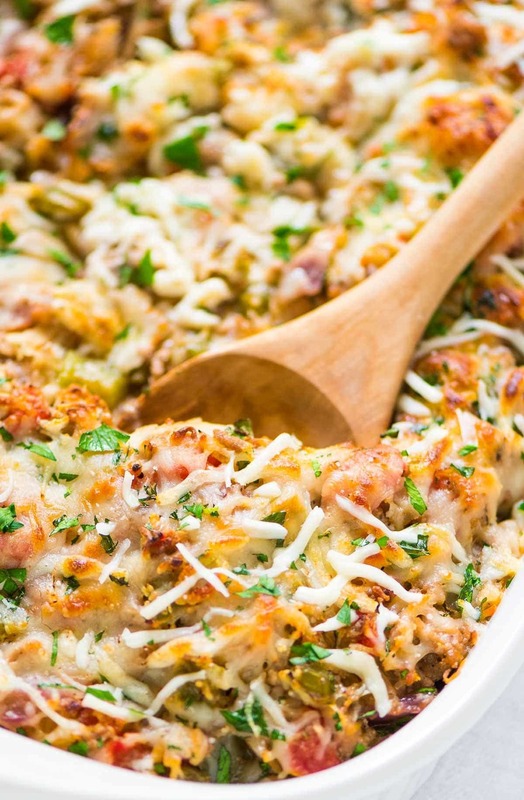 If spaghetti squash has been mostly a side hustle on your dinner plate too, this Spaghetti Squash Casserole with ground turkey is the perfect way to explore its versatility in main-dish recipes. The squash’s neutral flavor makes it easy to blend with a wide range of flavors, it adds bulk to just about any recipe, and it’s packed with vitamins C and A and high in fiber. It also keeps this Spaghetti Squash Casserole low carb. One serving of this healthy casserole has just 8 grams of carbs and a whopping 20 grams of protein! 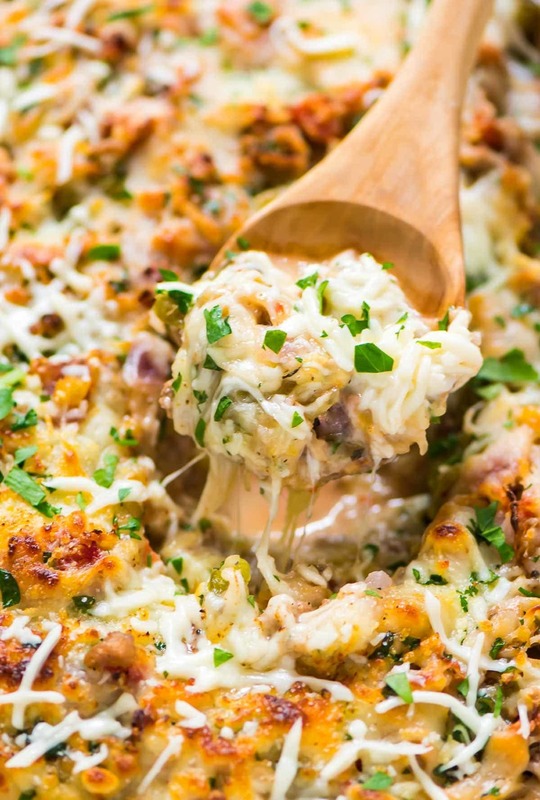 A shower of low-fat mozzarella on top gives this casserole that iconic bubbly, cheesy casserole “lid,” but if you are avoiding dairy or want to make this Spaghetti Squash Casserole Paleo, you can always omit it. Household members divided on the cheese? Keep it on the side and allow each person to sprinkle on his or her own. For a little step by step, I have a new video for you below. If you try this recipe, I’d love to know what you think. Thanks as always for your kind reviews and the 5-star ratings too. I can’t say enough how much they mean to me and how helpful they are to others who might be considering the recipe too! 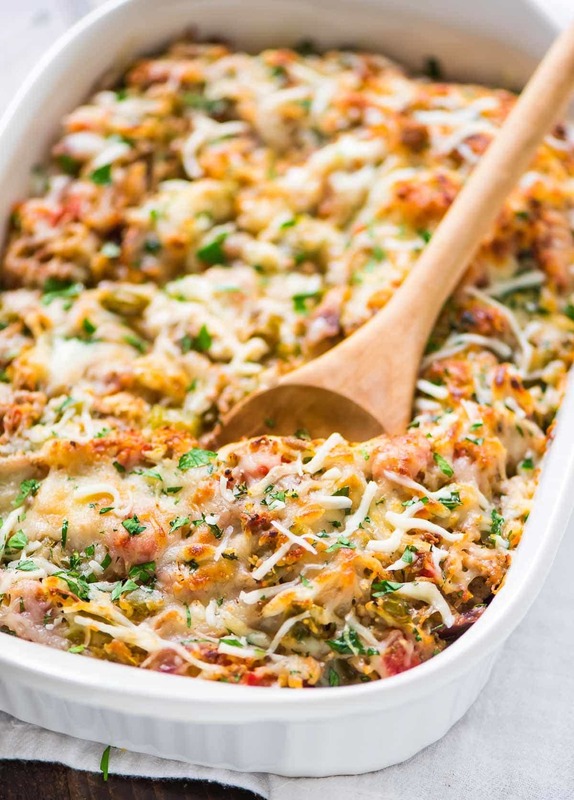 Healthy Spaghetti Squash Casserole with ground turkey, tomatoes, and Italian spices. Easy, CHEESY, and a crowdpleaser. Low-carb and gluten-free recipe! Preheat oven to 375 degrees F. Slice the squash in half lengthwise and scoop out the seeds. Place in a shallow baking dish, cut-side down, and then pour 1/2 cup water into the dish, around the squash. Bake for 35 to 40 minutes, until the flesh of the squash is easily pierced with a fork. When cool enough to handle, pull the squash strings out of the squash's center with a fork and transfer to a large mixing bowl. The squash strings should look like spaghetti. Reduce the oven temperature to 350 degrees F. Heat the olive oil in a large, deep skillet over medium high. Add the turkey, onion, bell pepper, salt, and black pepper. Cook, breaking apart the meat, until meat is browned and the vegetables are tender, about 8 minutes. Add the drained tomatoes, garlic, Italian seasoning, and red pepper flakes. Let cook until most of the liquid from the tomatoes has cooked off, about 4 minutes, and then add the reserved squash. Cook and stir until most of the remaining liquid has cooked off, about 1 to 2 minutes more, increasing the heat if needed. Stir in 1/2 cup of the shredded cheese. There may be some liquid remaining in the pan. Lightly coat a deep 8x8-inch baking dish or 2-quart casserole dish with nonstick spray. With a slotted spoon, scoop the squash mixture into the pan in an even layer, discarding any excess liquid (some in the pan is OK—just not too much). Bake, uncovered, for 20 minutes. Remove from the oven and sprinkle with the remaining 1/2 cup cheese, and then return to the oven and bake until the cheese melts, about 5 to 10 additional minutes. For an extra-golden-brown top, place the casserole under the broiler for a few minutes. Remove from the oven, sprinkle with parsley and/or basil, and let rest 5 minutes. Serve hot. Make it ahead: Spaghetti squash can be roasted, shredded, and stored in an airtight container for up to 3 days. When ready to make the casserole, add to the filling in Step 2 as directed. I haven't tried freezing the casserole yet, but as a reader pointed out in the comments (thanks, Andrea! ), spaghetti squash can get watery when thawed. If that doesn't bother you, here's what to do: Bake as directed, let cool, and then tightly cover and freeze for up to 3 months. Let thaw in the refrigerator overnight. Heat in a 350 degree F oven, covered, until warmed through. Uncover and bake 5 or so additional minutes, until hot and bubbly.